Three Forks has weathered much. Facing new pressures, can it stay in control? Gene Townsend likes to talk about railroads. Seated at his kitchen table, the longtime mayor and city council member takes a sip of coffee — his third cup of the day. It’s not yet noon. Townsend has lived nearly all of his 67 years in the Three Forks, Montana, area. He’s had a hand in most civic organizations and community-centered efforts in town, making him the perfect person with whom to talk about the past, present and future of Three Forks. Perched on the edge of the state’s fastest growing county, the town has managed, so far at least, to keep its expansion moderate, its economy strong and its beloved identity mostly intact. But how it has managed to do what so many other small towns across the state have not, and whether it can continue to do so, are other questions entirely, ones that people like Townsend spend their days pondering. Missouri Headwaters State Park near Three Forks, Montana. Three Forks has been and always will be a railroad town, though these days the presence of trains rings more afterthought than lifeblood. Founded in 1908 by a worker for the Chicago, Milwaukee and St. Paul Railway Company, the town was one of many formed to provide a source of passengers and freight along the winding, multi-thousand-mile route from the Midwest to the West Coast. The Milwaukee eventually made Three Forks a major thoroughfare, building a storage and repair facility and running a handful of trains up and down the tracks off Main Street daily. The competing Northern Pacific also built a large depot at the other end of town to serve its well trafficked Butte line. 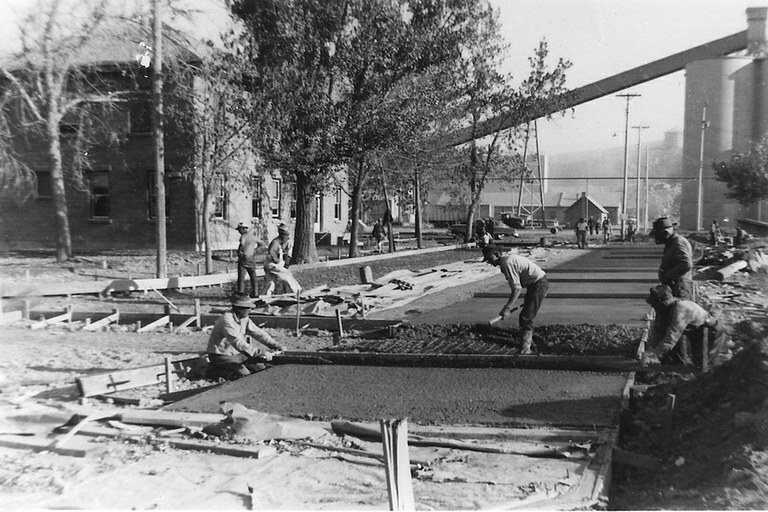 Workers pave a road in downtown Trident, Montana around 1920. Courtesy of the Bozeman Daily Chronicle. Townsend was born in Trident. His father, a native of eastern Montana, worked at the cement plant, returning home every night to what was essentially employee housing — $21 a month for a home and garage shared by the family of seven. In the 1950s, Townsend says, the facility had grown to employ some 300 people. A sign for the plant along Montana State Highway 2 read “Help wanted,” and company representatives would often loiter around the train stations, offering jobs to hobos riding the rails. The railroad paid slightly better than the cement plant, Townsend says, citing his father’s $2 an hour paycheck, but both were the main drivers of the area’s juvenile economy. Townsend’s family eventually moved into Three Forks proper in order to be closer to the high school. On the land that Meriwether Lewis described as “extensive and beautiful” there were plenty of ways to spend time. 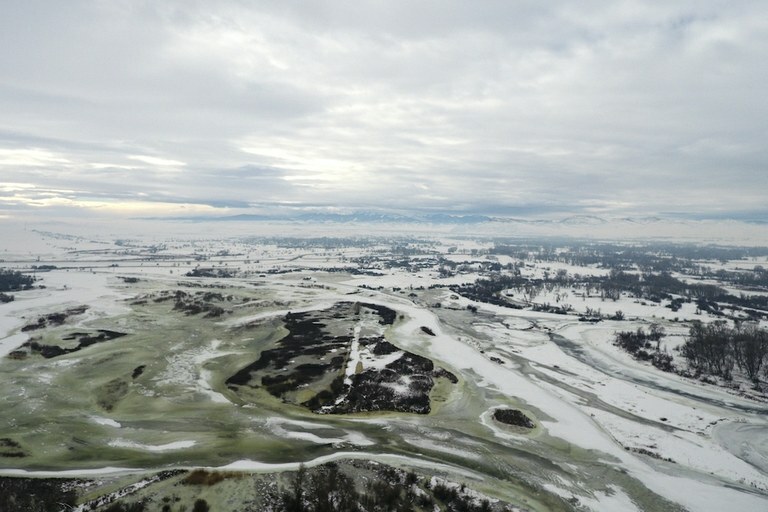 Townsend remembers exploring the nearby Horseshoe Hills or fishing on one of the Madison, Jefferson or Gallatin rivers. On the weekends he paid 50 cents for a movie and popcorn at the downtown theater, or, if it was a home game, followed the rest of town to the Three Forks High gym to watch the basketball team take on one of its local rivals. Between the railroad, the cement plant and the pair of talcum plants — the larger of which opened in 1961 to process raw minerals mined from an open pit 60 miles south in the Madison Valley — there have typically been enough jobs to go around in Three Forks. At their respective peaks, the industries combined to employ close to 750 people — a lot for a town that has yet to officially break 2,000 inhabitants. Everyone, Townsend included, worked at one of the big three or was related to someone who did. After graduating from Three Forks High, where he was a lineman on the football team, Townsend spent brief stints at Montana State University (“They told me I was as smart as I was going to get”) and worked construction before returning to Three Forks where he got a job as a boiler operator at the talc plant. Over the 40-odd years he was employed at the plant, Townsend estimates he worked for seven different companies. But despite the inherent unpredictability of extractive industries, as well as turnover at both the talc and cement plants (the former was most recently sold in 2011, while the latter is currently undergoing a change in ownership), he says there’s never been much concern the companies would shut down for good. The talc plants, too, appear in good health, if their part in a recent $340-million sale to a French conglomerate is anything to go by. The two mills together employ more than 100 people. But Townsend shares the view of many in town that while the “big three” were critical for the area’s economic health and do a good job supporting the community (the talc plant helped build Three Forks’ baseball field, for example), it would be foolish to lean too heavily on one or two employers. This sentiment is particularly salient given the town’s historic relationship with its founding industry. In 1977, following a steady decline, the Milwaukee railroad filed for bankruptcy and eventually shuttered its operations in Three Forks. Dozens of families left town. There are plenty of examples that prove Townsend’s point about the area’s economic resilience. Take Jared Brown, who started his contracting business BBG Contractors in 2008 and now employs more than a dozen people. And then there’s the Kanta family, whose masonry business on the south side of town has been hiring since the 1940s. That’s in addition to smaller shops like Seiler’s Hardware on Main Street, the several banks, bars and restaurants, as well as the medical clinic — not to mention the numerous self-employed locals who run businesses out of their homes. From a wages perspective, these jobs might not single-handedly pay enough to buy a new car or a house with a yard. But they typically pay enough to allow locals to continue living in Three Forks. And for many, that’s good enough. One of the people who stepped in to fill the void left by the railroad was Dean Folkvord. The son of a wheat farmer, Folkvord grew up in Helena and graduated from MSU before acting on his dream to open a bakery using his farm’s grain. Wheat Montana’s first storefront opened on College Street in Bozeman, but Folkvord and his wife soon decided it made more sense to move the operation as close to the farm as possible. Visible from the highway, the resulting processing plant/bakery/deli is situated just south of the family’s 11,000-acre wheat field. The operation has expanded markedly since its inception in 1993 and currently distributes its breads all over the West. 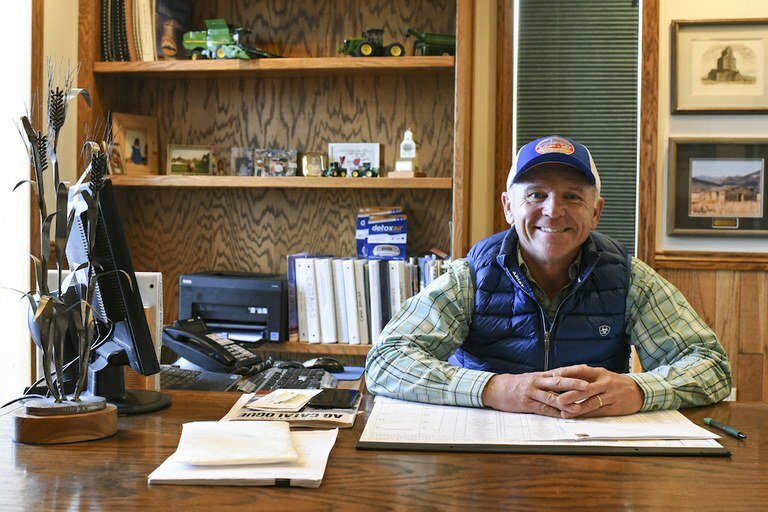 Sitting behind the large polished wood desk that takes up most of his office — a small room connected to the deli — Folkvord, wearing a puffy vest and blue Wheat Montana baseball cap, has the straightforward nature of a career businessman. Wheat Montana CEO Dean Folkvord sits for a photo on Jan. 16, 2018 in his Three Forks office. Folvord began the company with his father in 1990 and moved to the intersection of Highway 287 and I-90 in 1993. All told, Wheat Montana employs 190 people, many from Three Forks, but a good chunk make the drive from nearby communities like Harrison, Cardwell or Toston. They’re not alone: roughly a third of workers in Three Forks commute more than 30 minutes each way, which suggests that, while local employment might be strong, a healthy segment of workers are looking beyond their hometown for higher wages or different jobs. As the business has grown, Folkvord has diversified. In 1997 he built a subdivision, a 14-lot expanse in Broadwater County. In 2010, he renovated and reopened the historic Sacajawea Hotel, which, on many nights, is the busiest place in town (“As the Sac goes, so goes Three Forks,” one resident said). The family is also renovating the old Rainbow Motel in Bozeman and is in the process of building out a 10-lot residential subdivision on Front Street in Three Forks. Roughly half of renters in the area devote more than 30 percent of their monthly income towards housing, the widely accepted benchmark for affordable housing. The median price for a single family home was $250,000 in 2017, up nearly 25 percent from the year before. There are lots for sale within city limits, though not many, and their prices, spurred by Bozeman’s top-heavy real estate market, are rising. Lots that went for $10,000 or $15,000 a decade ago are now being sold for twice that. “It’s all a function of Bozeman’s growth,” Folkvord says. Diane Fuhrman, a real estate agent born and raised in Three Forks, says many of the people looking to buy houses are either relocators from the Bozeman area in search of cheaper rent, or new arrivals to the valley who were scared off by high prices in the shadow of the Bridgers. “Housing has gone up something terrible in the last two years because more people from Bozeman and Belgrade are moving out here because, for them, it’s affordable,” Fuhrman says. Part of the issue is geography. Blocked in to the north, east and west by its eponymous trio of rivers, much of the city sits on a floodplain requiring that, per state regulations, developers must build above the hypothetical water line. These costs add up, Folkvord says, sometimes tacking an additional 20 percent to a project’s price tag. Outside city limits, in Broadwater and Gallatin counties, the need for septic and well water systems typically offsets any savings developers might see by avoiding the floodplain in the first place. The city has created what it calls a “development donut” that stretches into the farmland around Three Forks city limits — a double-edged attempt to encourage landowners to sell off or develop their property in order to increase housing stock and eliminate county sprawl. But so far, none have bit. What Three Forks’ land constraints do offer is a natural buffer against rapid, uncontained growth, a tradeoff many are willing to take. While the population jumped from 1,500 to 1,900 between 2010 and 2015, the spike came after a 50-year period of relative stagnation. But for a town full of people accustomed to knowing their neighbors and recognizing every face at the bank, the change is noticeable. Denny Nelson, another member of the city council, moved to Three Forks in the 80s for reasons that were echoed around town: priorities like a strong sense of community, quieter lifestyle and the running joke that the traffic lights are always green (the town has no traffic lights). “Anybody who you talk to who’s been here a number of years will make that same statement, that there are a lot of new faces at the basketball game or at the café,” the 75-year-old Nelson says. This is more than just self-preserving nativism, though; the relationship between the two cities has always been like this, more or less. When Townsend was growing up, he says his family would take two trips per year to Bozeman — “the big town” — once to do their Christmas shopping and once for their annual doctor’s appointment. Bozeman’s growth has brought with it a perception, shared by some Three Forks residents, that the city has outgrown not only itself but the state as a whole. “Make Bozeman Montana Again,” reads one of many pithy bumper stickers. 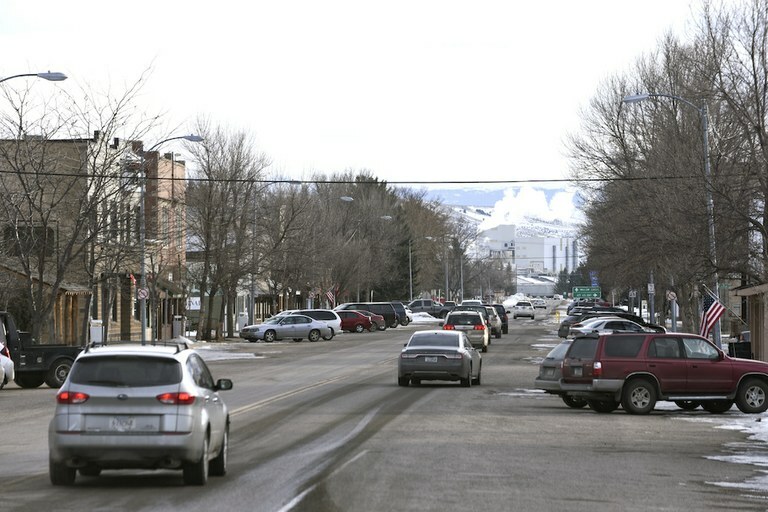 If Bozeman 60 years ago was so starkly different to Three Forks as to earn the nickname “Big Town,” it’s not hard to imagine the new epithets its neighbors have for the state’s fastest-growing city. Growth in the valley, however, has undoubtedly benefited Three Forks. The days of soliciting freight hoppers to work in the cement plant are long gone; there are enough hands to fill jobs in town. Plenty of people commute into Bozeman for work, but not too many that it’s become a measurable drain on the Three Forks economy. It’s easy to talk up small-town values and the importance of ambiguous terms like community, but for Three Forks residents, tangible examples come easy. There are the town’s large events — the rodeo, Christmas stroll, high school sports — all of which are hugely popular and always well-attended. Then there are numerous instances of locals uniting behind a cause, like when teenager Gavin Foth was seriously hurt in an ATV crash last fall, or the the deaths of Montana Highway Patrol Trooper David DeLaittre (who has since been commemorated with a park on the west side of town) and Broadwater County Sheriff’s Office Deputy Mason Moore. Cars travel along Main Street at the end of the day, Jan. 17, 2018, in Three Forks. Like many in town, Hamilton has a second job: teaching high school science. While chatting during his free period, several teenagers milled around Hamilton’s classroom, which is full of textbooks, scales and comical photos of Hamilton cautioning students to be careful when using equipment. “Maintaining that character and enhancing it is one of the big priorities we have. That doesn’t mean shutting off growth, it just means growing in the right way,” he says. Three Forks owes much of its existence to the railroad. The same economies that were born out of the railroad industry helped the area continue to thrive after it left. On a recent bitterly cold afternoon, a train clattered its way down the tracks south of town, its whistle sounding like some kind of reminder. A few of the old railroad buildings, one of the first things you see entering Three Forks, still stand, having found new life as a museum, a Chinese restaurant and a casino. Finishing his coffee, Townsend admits it’s difficult to point to exactly why Three Forks has grown while so many other small Montana towns have struggled to keep their heads above water. Luck and timing certainly play their parts, and the proximity to a flourishing metro like Bozeman has provided the town an economic buoy. But still, he says, there’s something intangible that has contributed to its success. And it’s this force, the one that propelled the town forward despite the loss of the railroad, its seminal industry, that will keep Three Forks chugging along well into the future.